Within the general area of improving durability, by far the greatest use of silica fume has been in concrete susceptible to corrosion caused by chloride ion attack of the reinforcing steel. This category includes concrete exposed to either deicing salt or to marine salts. 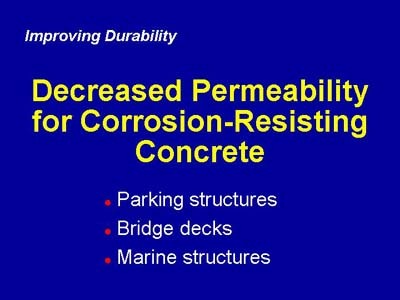 The protection mechanism in this case is primarily the reduction of the permeability of the concrete, which significantly increases the time that it takes for the chlorides to reach the level of the reinforcing steel.